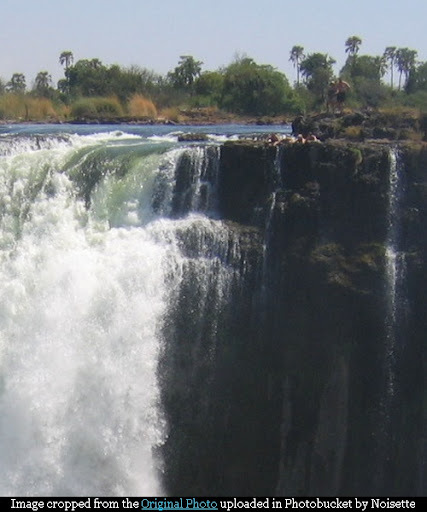 Ever imagined swimming at the edge of the mighty Victoria Falls with a sheer precipice of 108 metres - about twice the drop of Niagara Falls? Well it is possible and doesn't need much of a bravado, though it is not for the chicken hearted. There is a naturally formed rock barrier near the edge of the falls which has resulted in creation of a small pool known as the Devil's Pool. The barrier reduces the velocity of water and during the lean flow periods, (depending on rainfall usually Aug/Sept to Jan/Feb) people can swim as close as possible to the edge of the falls, peek down into the gorge without falling in the chasm. At other times when there is higher flow in the river, the ledge doesn't offer full protection and entry in the pool is not allowed. Here is a zoomed and cropped view of the spot taken from the other side. The original image from which above is cropped. Image from Photobucket is by Noisette (View fully enlarged image). 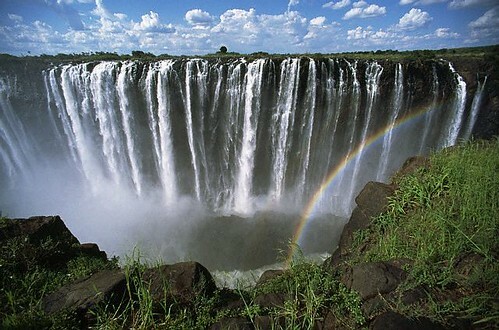 The pool can be accessed via Livingstone Island in Zambia. Note about location: There is some confusion regarding the actual location of Devil's Pool. A Google Earth Community member posh_tim in his post entitled "Angel's ArmChair" has placemarked it at -17.924854, 25.859109. Though as per about.com, the Angel's Armchair is not the real thing. 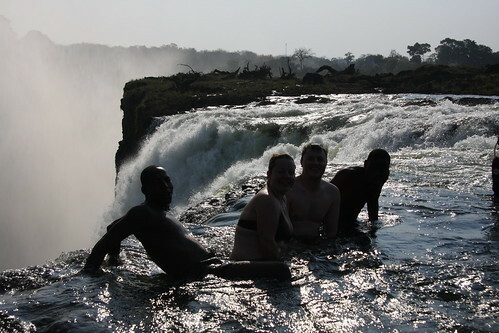 It is a milder alternative to Devil's Pool, easier to get to and open from May to October. A travel community web site http://www.traveldudes.org has marked it at -17.925018, 25.861721. I have shown the location based on the Panoramio image of snorth. This incredible image has been viewed more than 41,000 times and is my best bet for the location. May be some reader who has been to the incredible pool or has some positive information about the location can confirm/deny the location shown by me. Some Google Earth Community members had a try in finding the actual location on Google Earth. It appears that the location marked presently shown is the most likely location. Here is the link to the Google Earth Community post. 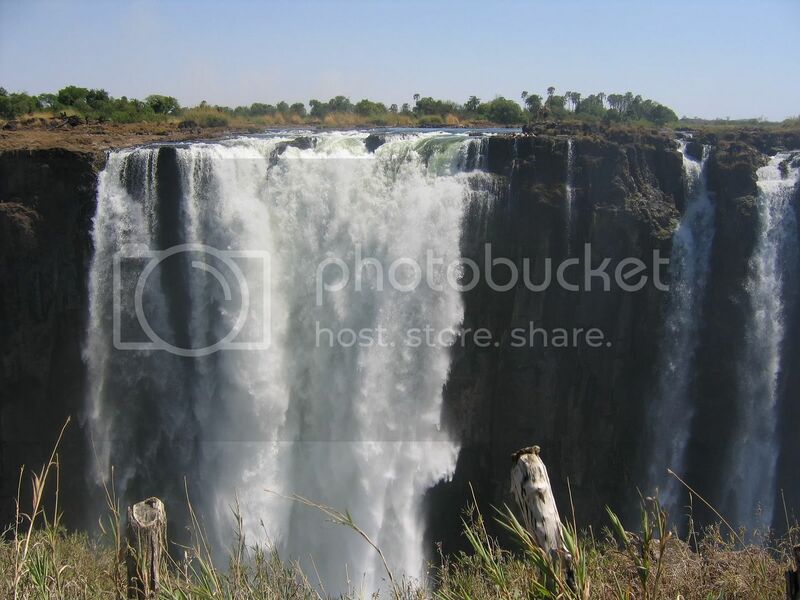 Based on the GEC post I have added the zoomed image of the location taken from the Zimbabwe side by Noisette - A GEC member and Master Guide with more than 7000 posts to her credit. I was able to get in touch with tour operators/ground activity providers who conduct tours and/or provide various tour facilities in the area and they have confirmed that the location shown by me is the correct location. I am thankful to Lloyd Shambira of tongabezi.com, Lister Nyathi of wildhorizons.co.za and Shafiq Hasan of pinnacleluxurytours.com who on my request have checked and confirmed location. Thank you Lloyd, Lister and Shafiq.